The UNM Civil Engineering Department won a prestigious award from the National Council of Examiners for Engineering for “engaging students in collaborative projects with professional licensed engineers”. 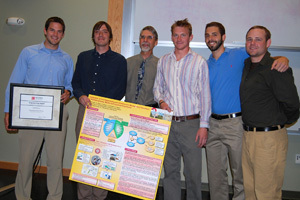 The award honors UNM’s Capstone Course (CE 497/499), a unique integration of construction management and civil engineering skills into a design/build project format. 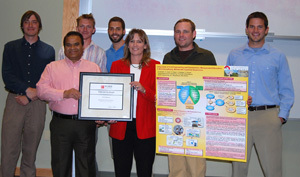 Representatives from the New Mexico Board of Professional Engineers and Surveyors, Subhas Shah and Julie I. Petrocco-Samora (holding the plaque, above), presented a $7,500 check and a plaque to the course instructor, Andrew Schuler, Assistant Professor of Civil Engineering, on April 29. "It is especially rewarding to be nationally recognized for something that integrates classroom teaching and professional practice,” said Arup Maji, School of Engineering Interim Dean and Professor of Civil Engineering. “This is also why we encourage all Civil Engineering faculty to have a Professional Engineering license." The students drew on information from their work in structures, geotechnical engineering, water quality, hydraulics, structures, and construction management. "We learned how to solve real world engineering problems while working in a true professional team environment," said Darren Mortenson, senior in Construction Management. "The capstone class prepared me for a career in design/construction."